When a family camping trip takes a dark turn, how far will one mother go to keep her family safe? That’s the question British-born serial expat Jo Furniss addresses in her newly-released debut novel All the Little Children. Jo previously lived in Switzerland, but is now based in Singapore. She here discusses how living in the City-state shaped her writing, and how she interacts with other local and regional writers. All the Little Children is a dystopia, on Thursday Jo will follow up this post with a second one exploring the whole idea of dystopias. Jo trained as a journalist, and worked for numerous organisations including the BBC and The Economist. In 2015, she founded SWAGLit an online literary magazine for writers in Singapore. All the Little Children is set in Britain, and features working-mother Marlene Greene. Marlene hopes a camping trip in the forest will provide quality time with her three young children - until they see fires in the distance, and columns of smoke distorting the sweeping view. Overnight, all communication with the outside world is lost. Knowing something terrible has happened, Marlene suspects that the isolation of the remote campsite is all that’s protecting her family. But the arrival of a lost boy reveals they are not alone in the woods, and as the unfolding disaster ravages the land, more youngsters seek refuge under her wing. The lives of her own children aren’t the only ones at stake. When their sanctuary is threatened, Marlene must decide whether she should save her own kids or try to save them all? My debut novel was born in the isolation of a Swiss forest, but came to maturity amid the thriving literary scene of Singapore. Without either of these places, it wouldn’t have happened at all. While living in a tiny village about an hour from Zurich, I took an MA in Professional Writing by distance learning. Once a week, my two young kids went to a playgroup for a couple of hours and this was my chance to write. I had a strict routine: log in to the online tutorial and check my writing exercise for the week; put the dog on a lead and leave the house; complete a 20-minute walk through the forest. Every time, without fail, I had written most of the piece in my head before I got home. The connection between forest and writing became literal once I started All the Little Children. A survival thriller, it tells the story of a mother who protects her kids from a disaster by holing up in the woods. Although it is set in my home country of England, the sense of confinement and detachment that pervades the story came from those solitary walks in the foothills of the Alps. Then I moved to Singapore. Old habits remain: I still take a daily walk, but now through the rainforest. But I also developed new routines amongst a flourishing community of writers. I discovered the Singapore Writers Group (SWG) soon after arriving here. During our regular critique meetings, I shared and honed scenes from the manuscript. As well as improving the nuts and bolts of the novel – story, character, style – the SWG also gave me the support of like-minded people. Even so, it was easy to get discouraged once I started sending out the novel to agents – the Internet is packed with tales of woe concerning the pitiful chances of publication. But what I saw happening around me in Singapore – at SWG, at other groups, such as the local chapter of the Society of Children’s Book Writers and Illustrators, and amongst novelists I met on workshops at the Singapore Writers Festival (SWF) – was an alternative story of success. There were writers getting deals with big publishers, writers launching their own books and even imprints, writers winning international awards and acclaim. I started to hear the distinct sound of opportunity knocking – the heartbeat rhythm of inevitability that would come from simply putting one foot after another to complete a long journey. As the Singapore-based writer Shasta Grant said during an interview, there is a “writing life of abundance” on offer. You need considerable persistence to get a book, or any kind of writing, published and it’s easy to run low on belief, but the successes of my fellow writers became like fuel to my own determination. There’s a special energy in the air of Singapore, so much entrepreneurialism across many sectors, and I let myself get tugged into the slipstream. Now All the Little Children has been released I continue to be amazed by the abundance of the network here and I’m reminded how often people I’ve met in Singapore have pointed me in the right direction on this road to publication. Industry figures I met at SWF gave advice on approaching agents; one writer friend put me in touch with the agent who signed me up; famous authors I met at SWF agreed to read my novel and provide quotes for the blurb; even the local book superstore Kinokuniya has been supportive of a Singapore-based novelist. Just as the Swiss forest shaped my first novel, so Singapore’s landscape has worked its magic on the second. With the working title of Trailing Spouse, this novel tells the story of an expat wife who suspects her husband of doing more than business while on his travels. The writing journey continues! 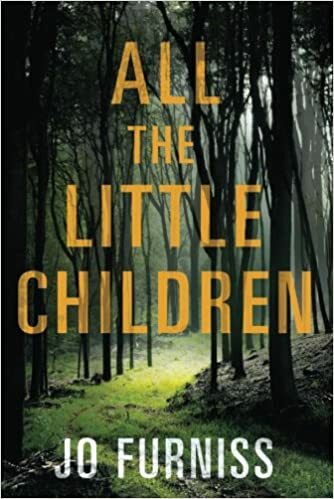 Details: All the Little Children is published in paperback by Lake Union Publishing, the publishing arm of Amazon, priced in local currencies.